Pieces: 883 (with six minifigures). I have to apologize in advance. 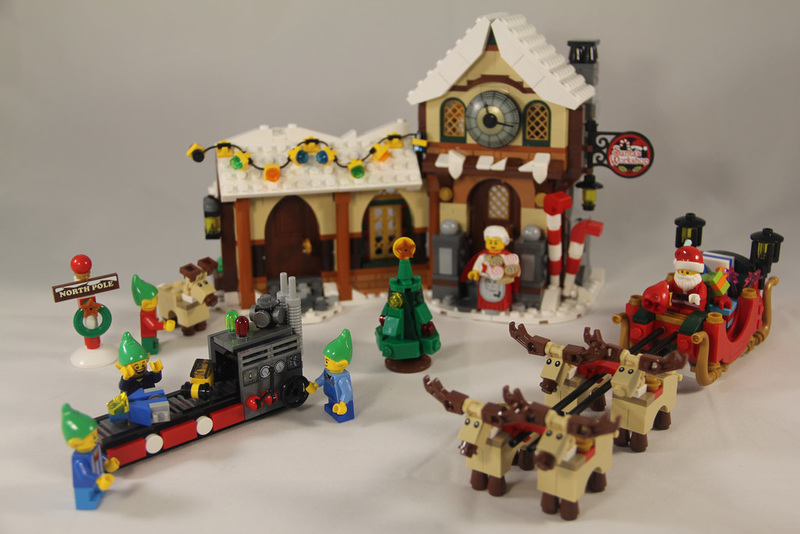 I know you were expecting a review of 10251: Brick Bank, but I thought that seeing it was December, some Christmas set reviews were in order! 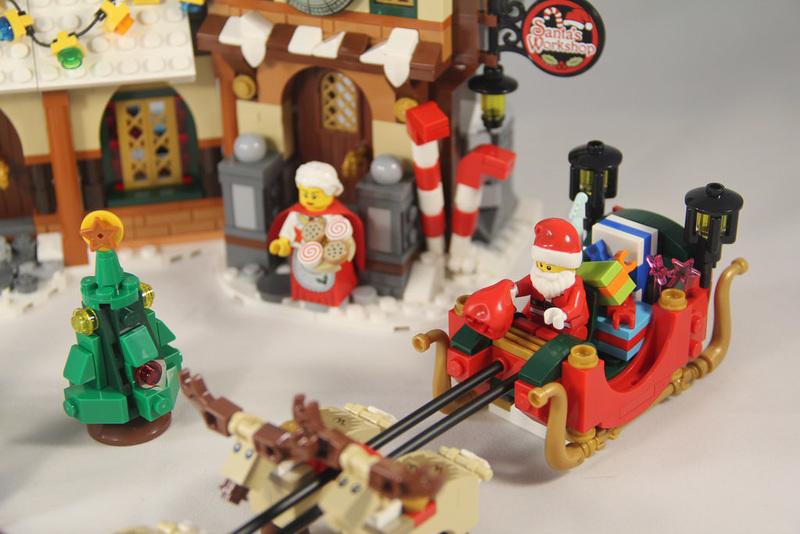 So, for the last three Mondays in December, I’ll be reviewing some Christmas sets, with the new year having the Brick Bank review. 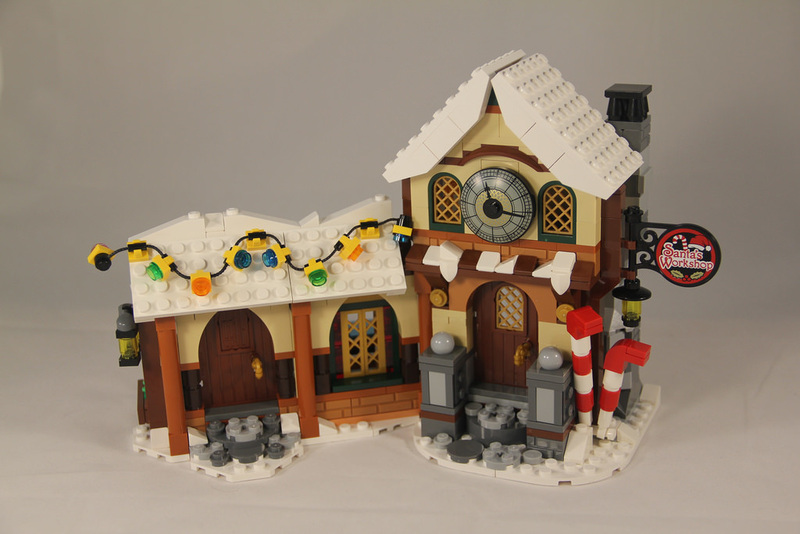 This week I’m looking at a set from 2014 – 10245: Santa’s Workshop. In the box are nine numbered parts bags, a bag with two instruction booklets and a sticker sheet, and two black flex tubes. There are some nice parts included in this set, four of which are unique. 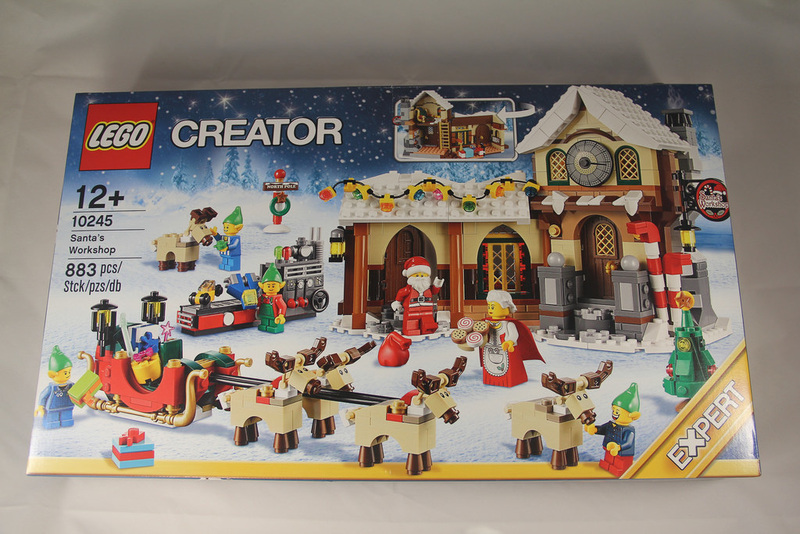 There is the aqua guitar, the 1×1 brick with eyes (used on the reindeer), the 2x2x2/3 plate with bow, used as the hindquarters of the reindeer, and Mrs Claus’s skirt. None of these are available in any other set. 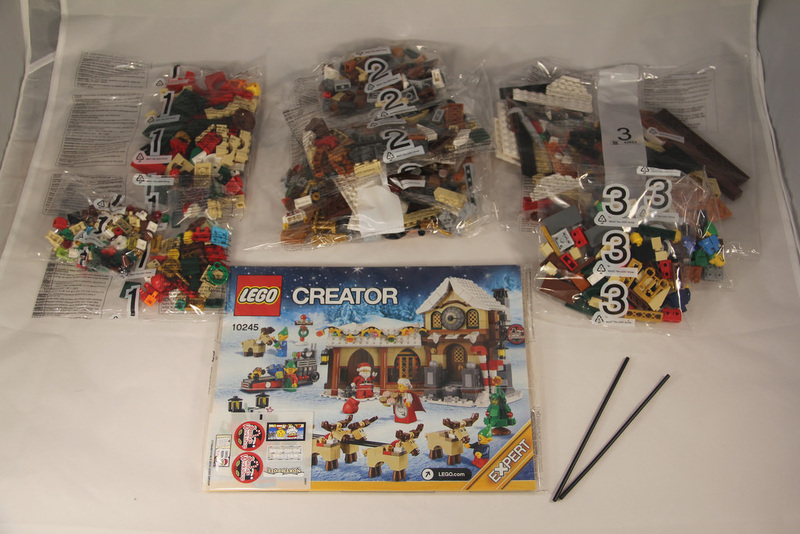 There’s also a large amount of parts that are very hard to come by, including the clock face, the 2×2 earth green tiles, Mrs Claus’s hair, Santa’s sack (which was new in red at the time this set was released), and that beautiful sign to name a few. 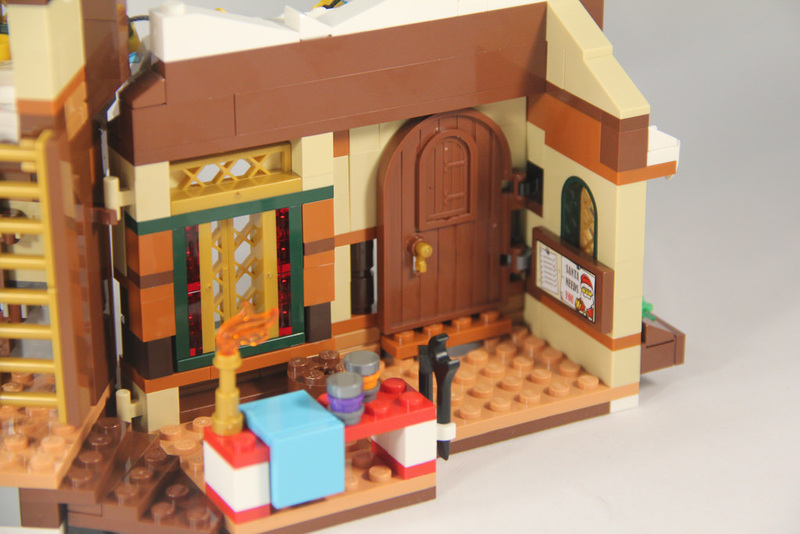 This set includes a lot of warm gold elements, a good selection of profile bricks, and some nice colours. The minifigures are also quite good. 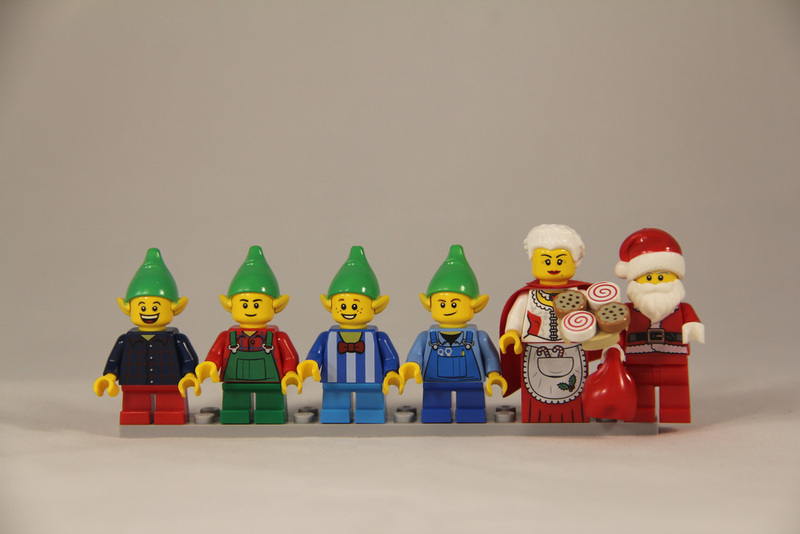 There are four mischievous elves, Santa, and Mrs Claus.The torso printing on all the minifigures is bold, but not new, and some have printing on the back also. Mrs Claus and the dark brown shirted elf have double sided heads, with Mrs Clause having a caring and angry look, and the elf having a huge grin, and a sad face. Both of the alternate prints don’t really fit the Christmas theme, but it’s nice to have them. Mrs clause has a very nice cape, and is holding a tray of cookies and candy. I particularly love the elf hats! The ears are a part of the hats, so it makes for some funny combinations when the right head is chosen. There’s plenty of play options with this set. 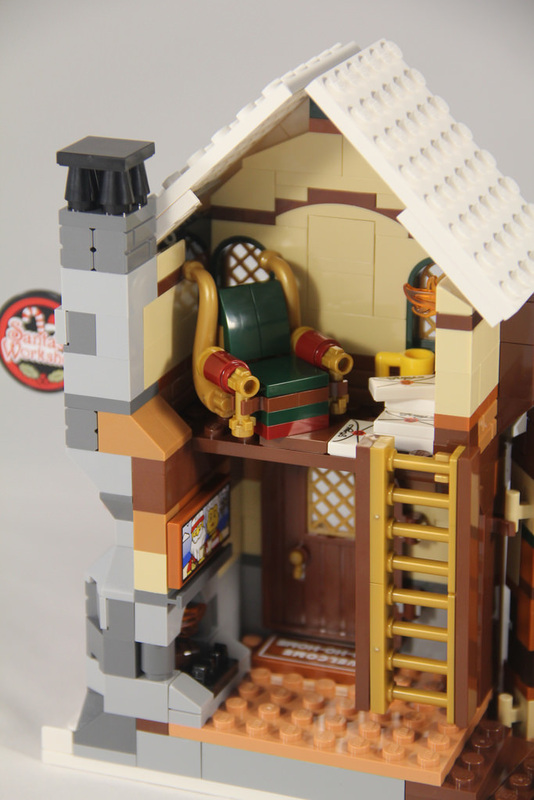 The sleigh and reindeer can be flown around, presents can be loaded up, elves can be busy making presents, and of course there’s the interior of the workshop, where Santa can read his mail! I may have been seen flying the sleigh around the room after building it. There’s no real moving parts, apart from the spinning dial thing on the toy making machine, and the keys and doors, but there’s still lots of play options. 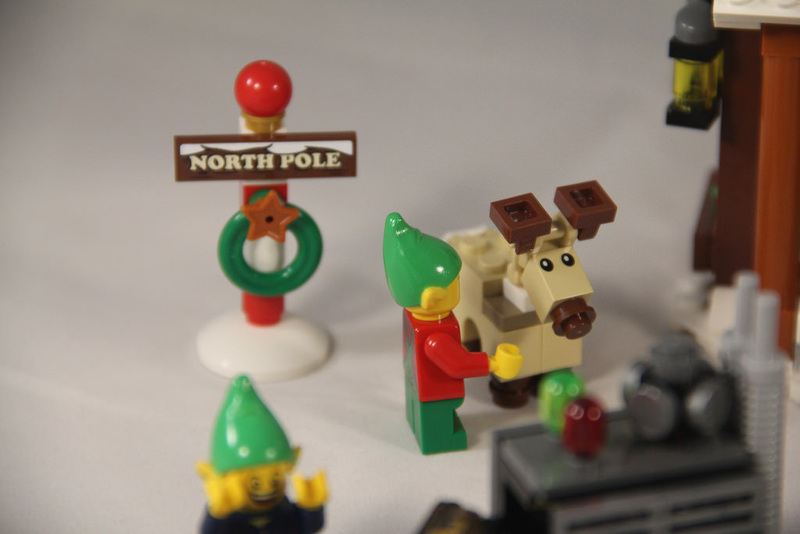 The build starts off with bag 1 containing the North Pole, a Christmas tree, Santa, and the baby reindeer. I really like the way the tree has been constructed. It’s almost like every Christmas there’s a new method. The reindeer is very cute, too. 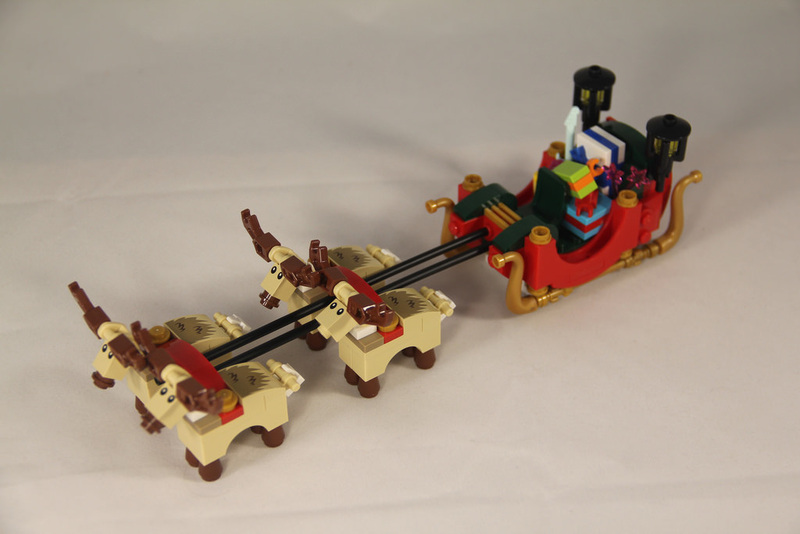 Next comes Santa’s sleigh, and the four reindeer. This sleigh is an absolute beauty. It uses a great amount of the warm gold elements, as well as some SNOT techniques. I was really impressed with this. The reindeer antlers do have to be slightly tweaked, as they hit each other when the reindeer are connected to the sleigh. The building itself is next. It’s pretty much blocks on blocks as you go up. The pillar things at the front use a little bit of SNOT, but it’s pretty simple stuff. As you go up, you’ll work on the interior, with Santa’s chair and all his mail sitting at the top. This section has a few stickers, with the workshop sign, and the door mat. It’s tricky to get circular stickers perfectly straight, so patience is key. The second half of the building is the workshop itself. There’s some simple building here, as well as a little workbench, however you do get a bit of SNOT in the large window. I did find it tricky to get the lights correct. It’s probably easier to fit the lights first, so they can be hung on the roof straight. There’s likely to be a bit of a twist in there somewhere. Finally, there’s the toy making machine. I really like this one, and the inclusion of what looks like a microscale version of a Classic Space craft, and a construction vehicle is genius. I really love this set. It looks brilliant, and is a fantastic display piece for Christmas. The sleigh is stunning, with cute reindeer, and plenty of little details on the building as well. 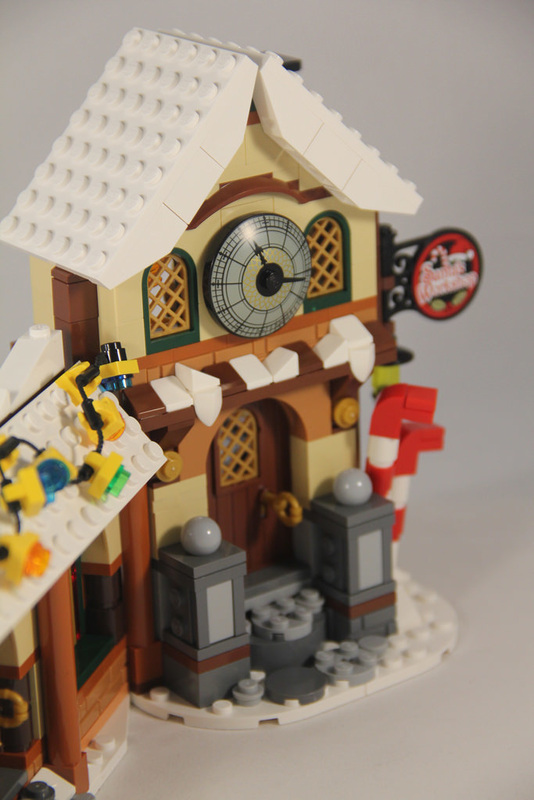 I particularly like the cobblestone paths at the doors, the snow falling from the balcony under the clock, the giant candy canes, and the fact that there’s also keys to the doors! Oh, and even Santa puts up Christmas lights. Combine this with the other Winter Village sets, and you’ve got quite a display. I would have liked to have seen Rudolph included, but that’s an easy fix. The six stickers included are good quality stickers, are interesting, and also quite funny. I really like stickers that are transparent, as sometimes the sticker and brick colours don’t match. Sets like the ones from the Winter Village theme are always popular, so the price has to be a factor. With this one, for $120, I think that’s quite fair. 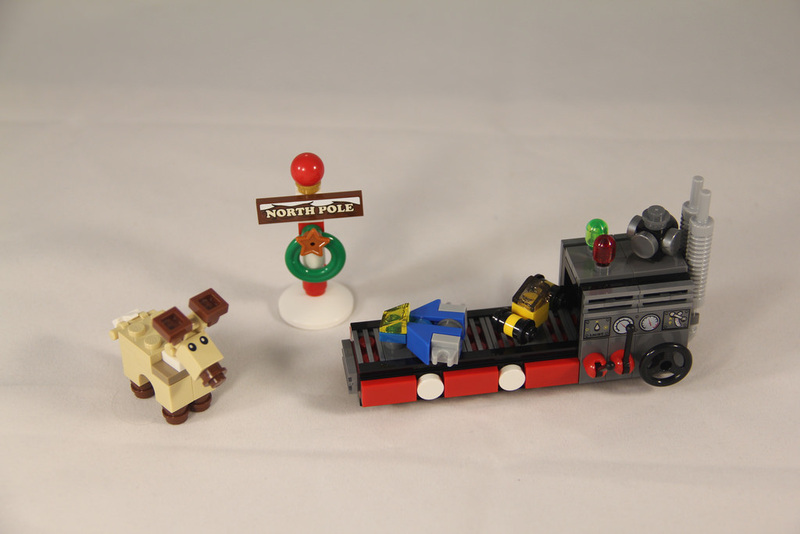 There’s some nice new elements included, some great minifigures that are not often seen, due to their seasonal nature. It’s not a ridiculously cheap price, but for 883 parts, you’re going to be paying around 13 cents per element, which is reasonable. Factoring in the nature of the parts, and that means relatively good value for money. As I mentioned before, the Winter Village sets are always popular, so collectibility is very high. There’s been eight Winter Village sets over the years, with one released each year, dating back to 2009. This is my first one, and I’m hoping to get some more. If you see this one, especially as it’s an older one, grab it while you can. 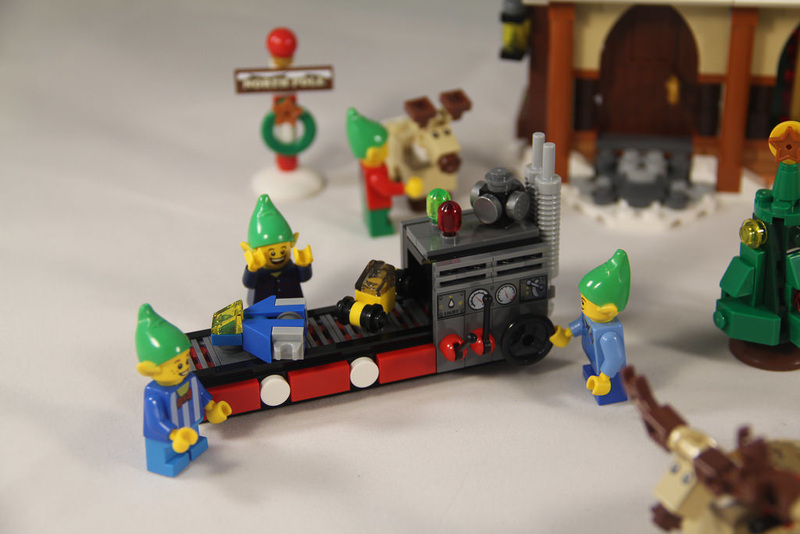 Next week I’ll be staying in the Christmas festivities with a look at 40138: Christmas Train. It’s a littler one, but still good to check out. Are there any Christmas sets that you’ve liked recently? Let me know in the comments.